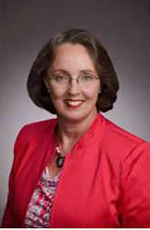 Linda S. Good was elected to the Lone Star College System Board of Trustees in May 2010. She is the Directing Attorney for Pro Bono and Disaster Response of Lone Star Legal Aid in Houston, where she has been employed since 1994. She has been an adjunct faculty member at LSC-North Harris and the University of Houston Law Center and has served as faculty for the NITA Trial Skills for Juvenile & Family Courts in Houston. She served on the Paralegal Advisory Committee at LSC-North Harris from 2002 until 2010, is a past chair of that committee, and mentored and supervised student interns from the Paralegal Program. She has also served her community as a Montgomery County Precinct Chair and as a member of the 2005 Montgomery County Election Equipment Task Force. Good began her higher education at the age of 32 and completed each degree in the traditional amount of time while raising three children. She earned a J.D. from the University of Houston Law Center in Houston; a B.A. with Phi Beta Kappa and a double major in History & Environmental Studies from Baylor University in Waco; and an A.A. with Phi Theta Kappa in Liberal Arts from Temple Junior College, in Temple.